LexioPhiles has published a list of the "Top 100 Language Blogs". The top of the list is dominated by blogs about learning languages (especially English), but there is a fair number of translation blogs. About Translation chips in at number 42. 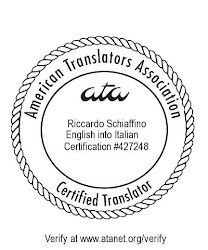 Other translation blogs of note on the list: Über Setzer Logbuch (23), yndigo (34), fidus interpres (43), Translation Blog (52), Blogging Translator (53), Musings from an overworked translator (69), Brave New Words (78), “la parole exportée” (87), Freelance Chinese Translator (90), and Thoughts On Translation (100). Check out the other blogs as well: they cover a broad range of subject from linguistics to grammar and from ancient languages to "exploring the effects of Web 2.0 on the English language". If the excellents About translation is #42 and Thoughts on translation is #100, then I can be sure that L'Observatoire de la traduction is not even in the list. Too bad! But it would be a good start if you could add it in your blogroll ;-). Thanks anyway for your so interesting posts. It is really good at teaching popular phrases. Which are the top websites for learning spanish at any level? Great list, thanks. It'll be useful for contacting fellow language professionals!